Instant relief from entrapped nerves! All pain has a nerve component. As with other sensations we feel, pain is carried by nerves to the brain. Pain can be attributed to four causes: joint instability, excessive stretch of a primary ligament, neurogenic inflammation, and/or nerve entrapment. Traditional dextrose Prolotherapy (including Cellular Prolotherapy) addresses the problem of the first two. Neurofascial Prolotherapy (Lyftogt Perineural Injection TherapyTM) is used to address neurogenic inflammation. 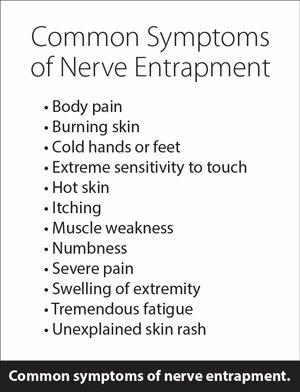 Lastly, when peripheral nerve entrapment plays a significant role in the symptoms, Nerve Release and Regeneration Injection Therapy (NRRIT) is the ideal, fast-acting treatment. What is Nerve Release and Regeneration Injection Therapy? NRRIT is a nerve hydrodissection technique that is highly successful for releasing peripheral nerve entrapments and restoring homeostasis. It is a quick, straightforward process, often with instant results for the patient! First, the practitioner uses ultrasound to identify the nerves being entrapped. Next, a natural solution is injected around the nerve to nourish the nerve and mechanically release it from the surrounding tissue, fascia, or adjacent structures. (See Figure 2.) Often, cellular solutions, such as stem cell or platelet solutions, are also injected at the nerve to promote nerve healing during the procedure as well. In our experience, this release after NRRIT often provides instant pain relief! Because most of the patients who we treat are suffering from more complicated, chronic pain conditions, NRRIT is most often used alongside traditional Prolotherapy. The reason a combination approach is often needed is due to the joint degeneration that needs regeneration. Nerve entrapments occur due to joint instability, direct trauma, and degenerative arthritis. Prolotherapy with Platelet Rich Plasma or Stem Cell Therapy may also be used in appropriate cases to restore the ligament strength and promote nerve healing directly. The repair of the supporting ligamentous structures with Prolotherapy prevents additional nerve entrapments by stabilizing the unstable joint(s). 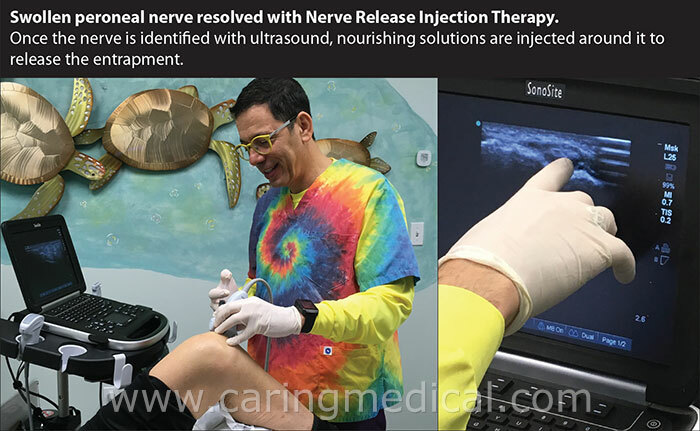 The release of the current nerve entrapment with NRRIT may also provide immediate alleviation of nerve pain while the Prolotherapy is working over the long-term to restore ligament strength in the area. It is an excellent combination approach! 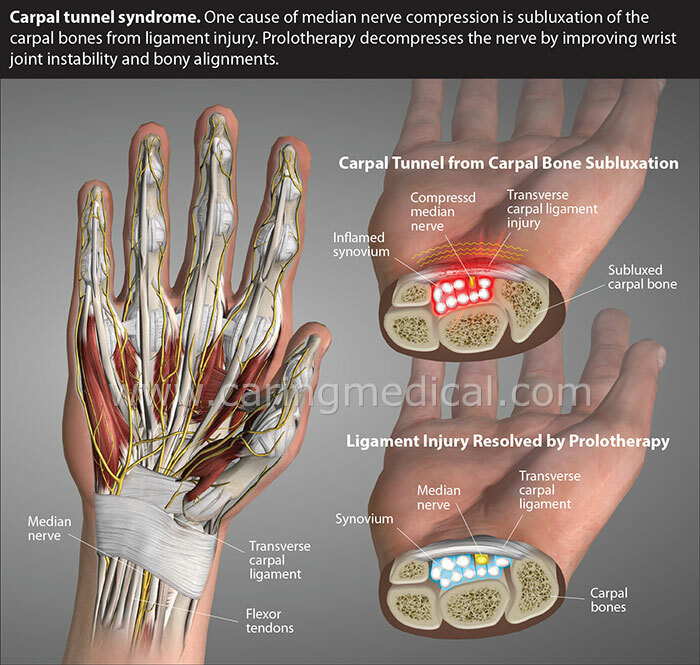 A key clue that a nerve entrapment syndrome such as carpal tunnel syndrome stems from joint instability is associated cracking, popping, or clicking in the joints near the bony tunnel. On physical examination, other clues include excessive motion or soft joint end feel compared to the non-symptomatic side, as well as tenderness when the ligaments of the nearest joint are palpated and stressed. 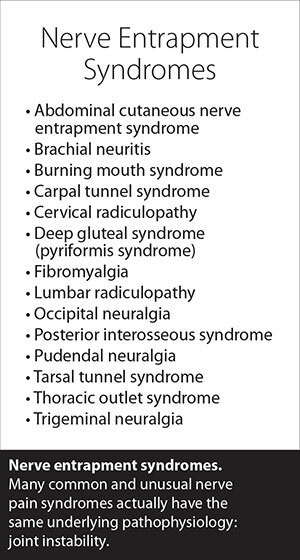 When these signs or symptoms are not present, the cause of the nerve entrapment is most likely not joint instability. Thus, these are more likely to be appropriate for NRRIT as the primary treatment. When given a diagnosis of any of the nerve pain conditions which commonly end with the words neuritis, neuralgia, neuroma, or syndrome, Nerve Release and Regeneration Injection Therapy is an excellent option. (See Figure 4.) Most of these conditions are easily treated with one, or a combination, of natural injection therapy techniques. This includes common conditions such as intercostal neuritis, occipital neuralgia, Morton’s neuroma, as well as thoracic outlet syndrome or piriformis syndrome. If the syndrome involves an irritated, compressed, or sensitive (to stretch or touch) nerve, most likely a simple in-office natural injection technique is needed to restore the nerve to health along with all of the tissues it innervates! (See Figure 5.) In our office, we have also had success with conditions that were traditionally treated with steroid injections, including De Quervain’s tenosynovitis and trigger finger. Steroid injections can have the unwanted side effect of causing fat atrophy, ligamentosis, or tendinosis, making NRRIT an excellent alternative. Nerve Release No Longer Requires Surgery! How Many Treatments of NRRIT are Required? Sometimes only one treatment is needed, but often, three to six visits are needed, especially in cases of severe joint instability where the nerve irritation is located. Patients suffering from nerve pain should not delay seeking medical care for these conditions. This cannot be overemphasized. Permanent nerve damage may occur. If the fear of surgery has prevented you from seeking help, please know that wonderful non-surgical treatment options now exist! Our team will be happy to help you! Please reach out to us to discuss your case. Let’s get you the help you need to restore your nerve function!